Made his debut with Iraklis Thessaloniki during the 1999-00 season. Played there till the 2003-04. Signed for the 2004-05 season by Panathinaikos Athens. 2016 - Named Euroleague Basketball Legend. Named the 2011 Euroleague MVP. Named the 2007 and 2011 Euroleague Final MVP. Named the 2005, 2006, 2007, 2008, 2009 and 2011 Euroleague Best Defender. Named to the 2006-07, 2010-11, 2011-12 and 2012-13 All-Euroleague First Team. Named the 2010-11 Euroleague February MVP. 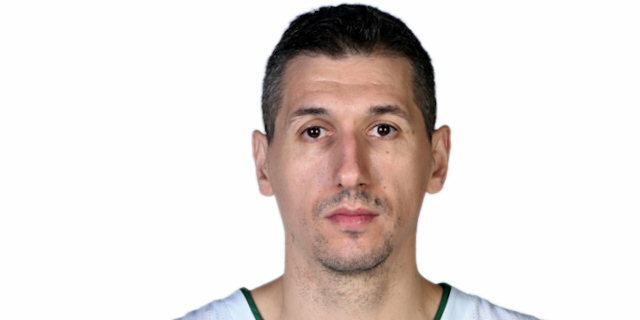 Named the 2011-12 Euroleague March/April MVP. Named the 2007-08 Euroleague Week-17 MVP. Named the 2010-11 Euroleague Week-3 MVP. Named the 2011-12 Euroleague Playoffs Game-1 and 5 MVP. Named the 2013-14 Euroleague Top 16 Round 5 MVP. Led the 2010-11 Euroleague in assists (6.23 apg.). Led the 2013-14 Euroleague in assits (6.2 apg.). Named to the 2005 All-European Championship First Team. Played at the 2003 and 2007 European Championships. Won the 2004-05, 2005-06, 2006-07, 2007-08, 2008-09, 2009-10, 2010-11, 2012-13 and 2013-14 Greek National Championship with Panathinaikos Athens. Won the 2005, 2006, 2007, 2008, 2009, 2012, 2013, 2014, 2015 and 2016 Greek National Cup with Panathinaikos Athens. Named the 2007-08 Greek League MVP. Named the 2009 and 2016 Greek Cup Finals MVP. Played the 2002, 2003, 2004, 2005, 2006, 2007, 2008, 2009 and 2011 Greek All Star Game. Led the 2002-03 Greek National League in steals (2.5 spg.). Has been member of the Greek U-20 National Team.